Robin Youngs, Edward Fisher,	The Journal of Laryngology & Otology, Volume 126 Issue 1, p 1. A Mudry,	The Journal of Laryngology & Otology, Volume 126 Issue 1, pp 2-7. L J McManus, M D Stringer, P J D Dawes,	The Journal of Laryngology & Otology, Volume 126 Issue 1, pp 8-14. L Masterson, S Kumar, J H K Kong, J Briggs, N Donnelly, P R Axon, R F Gray,	The Journal of Laryngology & Otology, Volume 126 Issue 1, pp 15-21. K Onal, S Arslanoglu, M Songu, U Demiray, I A Demirpehlivan,	The Journal of Laryngology & Otology, Volume 126 Issue 1, pp 22-25. M B Naguib, Y Madian, M Refaat, O Mohsen, M El Tabakh, A Abo-Setta,	The Journal of Laryngology & Otology, Volume 126 Issue 1, pp 26-33. E Kiverniti, G Watters,	The Journal of Laryngology & Otology, Volume 126 Issue 1, pp 34-37. 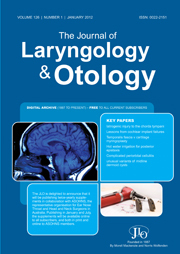 F Aksoy, Y S Yildirim, H Demirhan, O Özturan, S Solakoglu,	The Journal of Laryngology & Otology, Volume 126 Issue 1, pp 38-42. E Hoskison, M Daniel, J E Rowson, N S Jones,	The Journal of Laryngology & Otology, Volume 126 Issue 1, pp 43-46. D Han, W Xu, R Hu, L Zhang,	The Journal of Laryngology & Otology, Volume 126 Issue 1, pp 47-51. C Gadepalli, C de Casso, S Silva, S Loughran, J J Homer,	The Journal of Laryngology & Otology, Volume 126 Issue 1, pp 52-57. E Novoa, C Schlegel-Wagner,	The Journal of Laryngology & Otology, Volume 126 Issue 1, pp 58-60. J P Hughes, M S Quraishi,	The Journal of Laryngology & Otology, Volume 126 Issue 1, pp 61-62. H A Osborn, R Yeung, V Y W Lin,	The Journal of Laryngology & Otology, Volume 126 Issue 1, pp 63-65. T Y Kew, A Abdullah,	The Journal of Laryngology & Otology, Volume 126 Issue 1, pp 66-71. M Mandalà, L Colletti,	The Journal of Laryngology & Otology, Volume 126 Issue 1, pp 72-75. G P Davies, I J M Johnson,	The Journal of Laryngology & Otology, Volume 126 Issue 1, pp 76-78. G K Eminowicz, R Raman, J Conibear, P N Plowman,	The Journal of Laryngology & Otology, Volume 126 Issue 1, pp 79-82. R Locke, H Kubba,	The Journal of Laryngology & Otology, Volume 126 Issue 1, pp 83-87. B M Teh, C Hall, S W Chan,	The Journal of Laryngology & Otology, Volume 126 Issue 1, pp 88-93. N Parvizi, N Choudhury, A Singh,	The Journal of Laryngology & Otology, Volume 126 Issue 1, pp 94-96. A C Chu, A Mlikotic, M A R St John,	The Journal of Laryngology & Otology, Volume 126 Issue 1, pp 97-99. Multinodular goitre arising in the tracheal lumen: implantation or ectopic? R L Love, F Ahsan, R Allison, A Keast, N Lambie,	The Journal of Laryngology & Otology, Volume 126 Issue 1, pp 100-102. Z Sun, L Sun, Z Zhang, X Ma,	The Journal of Laryngology & Otology, Volume 126 Issue 1, pp 103-107.